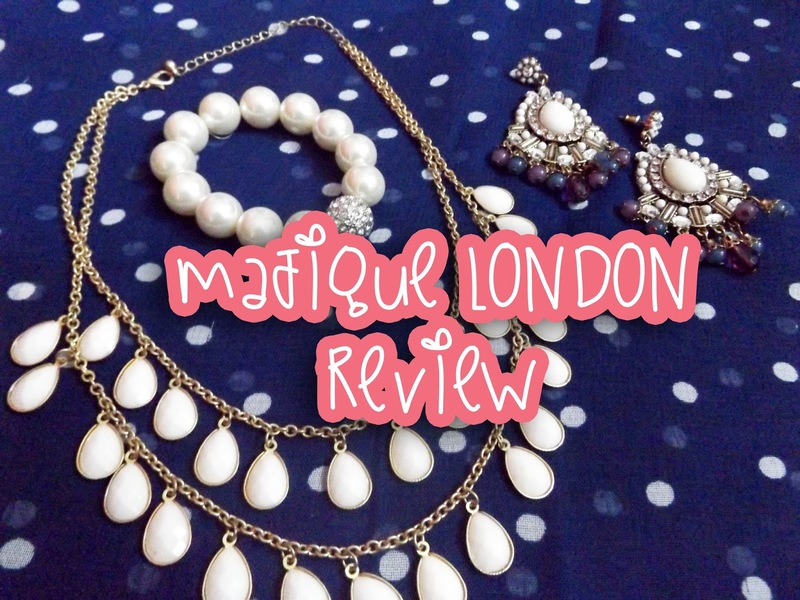 Today I'm back with another review on some stunning jewellery from Majique London. Today I'm reviewing an elegant large pearl bracelet, a gold necklace with white teardrop details and these beaded statement earrings. The pearl bracelet is elasticated which I love because it can be sometimes hard to judge if jewellery will fit your wrists, especially when you're buying online. I absolutely love pearls be it pearl earrings, necklaces and bracelets. I almost always buy jewellery if it has pearl detailing and when I saw this bracelet I knew I had to add it to my collection! The pearls are larger than normal which I love because I recently bought a necklace that this matches perfectly. I love the crystal detailing on one of the beads and I think it adds that extra touch of class and elegance to this piece making it look that much more expensive. This pearl and crystal bracelet retails for £17 and you can purchase it from Majique London here. Next up is this gold necklace with white stone teardrop detailing which I adore! The necklace is 39cm in length but can be extended by a further 8cm so you can set it to the right length for you. This necklace can be used to dress up an outfit or can be worn casually depending on what you are wearing and I love that it's so versatile that you can wear it with almost anything because well.. white goes with everything! I love how this necklace sits on my neck and love how it looks on, you can buy it from Majique London here. Last but not least are these gorgeous statement piece earrings. These earrings have so much detail they're just so pretty. They have cream acrylic stones, diamanté and crystal details as well as some purple beading on the end. I absolutely love the colours of the beads on these earrings because they're just so eye catching. These earrings are rather large so they're definitely not for people who are used to wearing small stud earrings, these are definitely a statement piece and you wouldn't want to be wearing much jewellery apart from these if you decided to wear them. The colours in these earrings are beautiful and the earrings look their best on a nice sunny day. These earrings retail for £19 and can be bought from Majique London here. My name is Claire, I'm 24 and I'm a beauty and makeup addict from Tipperary in Ireland. You can follow me on my social media accounts, linked below. Feel free to contact me if you have any questions or even just for a chat! Wet n Wild Megalast Lipsticks Review, Swatches & MAC Dupes! The Dangers Of Counterfeit Makeup and How To Spot Fake Products. NIVEA Men Post Shave Balm as a primer?!? W7 Cosmetics Go Concealer Review!